The subject of the paper is gender roles in the modern world: today, all else being equal, women from old plow cultures are less likely to be employed outside the house than women from hoe cultures, just as women do most of the agricultural work in hoe cultures like sub-Saharan Africa and New Guinea. The authors don't mention this but one example is that in the inner city neighborhoods depicted on The Wire, women hold most of the paying jobs, just as their foremothers did most of the farm work in West Africa. The hypothesis tested in this paper is whether at least part of the current differences in gender role attitudes arose from the historic mode of agricultural production - e.g., plough agriculture, hoe agriculture, shifting agriculture, etc. - which in turn affected the gender division of labor historically and the subsequent evolution of norms about the natural role of women in the family and society. Ester Boserup (1970) originally put forward this hypothesis in her seminal book Woman’s Role in Economic Development. She argued that to understand cross-cultural differences in attitudes about female labor force participation, one needs to reach back into history and examine differences in primitive agricultural technologies. She contrasts shifting cultivation to plough cultivation. With shifting cultivation, which is labor intensive and does not use the plough, women do most of the agricultural work. By contrast, plough cultivation is more capital intensive, but also requires more strength to manipulate the plough and the animals that pull the plough. 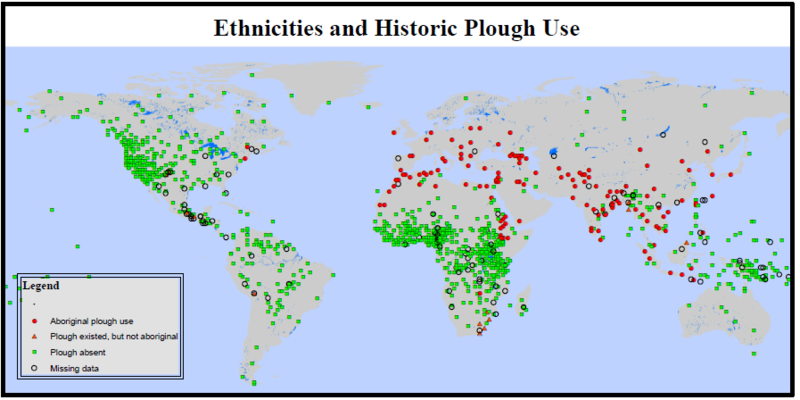 Therefore, in plough societies men tend to dominate agricultural work, while women primarily engage in home production and other activities that occur within the household. Boserup (1970) writes that plough cultivation ”shows a predominantly male labor force. The land is prepared for sowing by men using draught animals, and this. . . leaves little need for weeding the crop, which is usually the women’s task. . . Because village women work less in agriculture, a considerable fraction of them are completely freed from farm work. Sometimes such women perform purely domestic duties, living in seclusion within their own homes only appearing in the street wearing a veil, a phenomenon associated with plough culture and seemingly unknown in regions of shifting cultivation where women do most of the agricultural toil” (Boserup, 1970, pp. 13—14)3. In plough societies, a gender division of labor both in the field and in the family becomes predominant. Because women specialize in work in the domestic domain, the home comes to be seen as the ”natural” place for women, rather than outside the home in the fields or in the workforce. Interestingly enough, Boserup maintains that this division of roles persisted even after a country moved out of agriculture: factory work appears to be avoided by married women in many part of the developing world and there is considerable evidence that this social norm is widely accepted. This shift to ”bodily commodification,’ together with the decline of matriarchy, is deplored in the literature. Yet the consequences are not entirely negative. Matriarchy meant that African women bore a very disproportionate share of labor in raising their families, especially physical labor. Today, there is a move toward a more equal balance of parental investment between African men and women. And bodily commodification is perhaps a necessary precondition for much of what we call ”high culture,’ i.e., the pursuit of the aesthetic. In the 1960s in Northern cities, higher welfare for single mothers, allowing them to support their children without a husband (a policy that had worked in Sweden for a generation without disaster), appears to have caused a remarkably quick reversion among many poor African-Americans to sub-Saharan cultural tendencies, but without the traditional restraining structures of African village life.